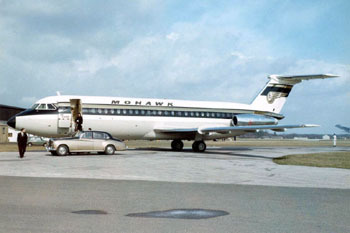 On June 23, 1967, Mohawk Airlines Flight 40, a British Aircraft Corporation BAC 1-11, crashed approximately one mile east of the town of Blossburg, Pennsylvania. The aircraft was destroyed by impact and fire. All 30 passengers and four crewmembers on board the aircraft were killed in the accident. Weather was not a factor. The National Transportation Safety Board (NTSB) determined that the probable cause of the accident was the loss of integrity of the empennage pitch control system due to a destructive in-flight fire. The fire originated in the auxiliary power unit (APU) air inlet plenum chamber and propagated into an adjacent hydraulics compensator bay, then up into the vertical fin where it destroyed the components of the airplane's pitch control system. The fire resulted from engine bleed air flowing back through the APU in a reverse direction due to a malfunctioning APU non-return valve and an open APU air delivery valve.